Who wouldn't agree that when we're little our grandparents are super heroes who know and can do everything. Nana tells us one of these stories, told from the perspective of a little girl. 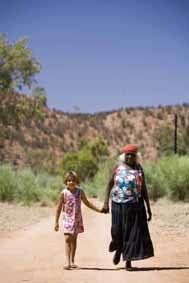 She follows here nana as she goes on a bush tucker hunting tour. Not only kills nana two lizards but also a wallaby and a kangaroo. Nana sells her drawings to white people who can't see that she paints just one story over and over again. At night Nana patrols the fringes of their Aboriginal community and easily beats up several male drunkards and destroys their booze. Set in Alice Springs where Warwick Thornton grew up, Nana is refreshingly humorous. Nana is well on its way to reach cult status among Indigenous film connoisseurs. Nana was filmed at Jay Creek. Warwick considers it to be the 'back story' of Samson & Delilah. Warwick has worked on a variety of films, music clips, commercial, documentaries and television programs. He was the Director of Photography of Rachel Perkin's Radiance.